There is an admission charge of $8.00 per adult and $5.00 for children under 12. The Hickory Ridge Concert Series presents the quirky New York City folk duo The Lords of Liechtenstein. The Lords of Liechtenstein is composed of two brothers, Noah (ukulele/guitar/vocals) and Dan Rauchwerk (guitar/banjo/mandola/vocals) who's tight harmonies and unison singing blend as only brothers can. NPR calls their music “...a soundscape akin to Simon & Garfunkel binging on The Everly Brothers and Netflix comedies…". The Lords often draw comparisons to The Everly Brothers for their harmonic sensibilities and to The Smothers Brothers for their mischievous onstage interactions. They are also excellent writers whose purposeful lyrics to tell musical stories that fluctuate between heart-wrenchingly sad and outlandishly ridiculous topics. 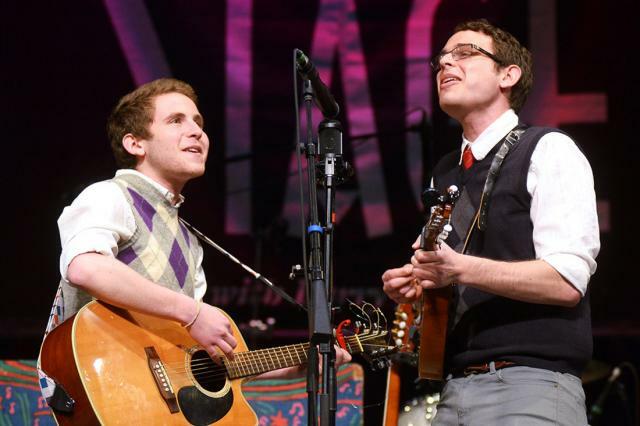 The Lords have performed on NPR’s acclaimed Mountain Stage radio show, were awarded honorable mention in the 2014 Falcon Ridge Folk Festival Emerging Artist Showcase, and have opened for musical stalwarts like Brett Dennen, Buckwheat Zydeco, Elephant Revival, and Aztec Two-Step. "They are like The Everly Brothers with an attitude." - said Mark Miller, Artistic Director of Urban H2O. The Hickory Ridge Concert Series is hosted by singer-songwriter Chris Vallillo. Concerts are held the 3rd Saturday of every month and begin at 7:00 p.m. with the doors opening at 6:00 p.m. Coffee, drinks, and a variety of desserts are available during intermission. For the full schedule go to www.hickoryridgeconcerts.com. For more information call 309/547-3721 or TDD 217/782-9175.